Social Justice Pathway sophomores Nadia Leinhos and Sarah Sundermeyer receive input from history teacher Eric Bloom. Right in the middle of an English class discussion, Palo Alto High School sophomore Sarah Sundermeyer stood up and left. Her teacher, Ms. Angell, was talking about the power dynamic which led to the Chilean Coup of 1973 when Sundermeyer realized that much like the Chileans struggled against a dictator, she, as a mere student, was living under the authority of her teachers. She felt obligated to show up at school every day because the administration kept track of her attendance and her teachers had control over her grades. In an attempt to challenge the power dynamic in the classroom in the same way the Chilean people historically overthrew their president, Sundermeyer ignored the astonished stares of her classmates and teacher and walked out the door. Three other students stood up to follow her. Most high school students would not dare to get up and leave in the middle of class without permission. However, slightly different rules apply in Sundermeyer’s English class, part of Paly’s new Social Justice Pathway. In the SJP, founding teachers Erin Angell and Eric Bloom encourage their 30 students to draw real life applications from the lessons in class. The structure of the SJP creates a great deal of trust between students and their teachers, offering students the opportunity to approach assignments with outside-of-the-box mentalities. The pathway also aims to provide students with the skills to impact social change in a meaningful way. For years, teachers at Paly had noticed a need for academic options where students could develop a sense of purpose in their education. Bloom and Angell wanted to create a program that would allow students to become assets to their community rather than just fulfilling a graduation requirement or adding another line to their transcripts. Two years ago, the Palo Alto Unified School District asked teachers to submit proposals for innovative programs that were unlike any the district already had. In response, Angell and Bloom gathered a group of excited teachers, then brainstormed and submitted a proposal. From the earliest stages, the SJP excited Paly principal Kim Diorio. After receiving one of four district grants, Bloom and Angell explored existing alternative programs around the Bay Area and attended conferences to further improve their proposal. The two traveled to Massachusetts to learn about the School Within a School program at Brookline High School. SWS provides 120 10th through 12th grade students with a more democratic environment and allows them to form closer relationships with their teachers. Angell and Bloom were particularly inspired by the SWS’s concept of student empowerment and student voice in the classroom. When creating the pathway, they looked to incorporate this idea into their curriculum. The pathway, currently in its inaugural year, the pathway comprises two classes that fulfill sophomore graduation requirements: a combined English 10 and 10 Accelerated class taught by Angell and a Contemporary World History/U.S. Government course taught by Bloom. The two will continue to teach this year’s first cohort of students in their English and social studies classes for three years, from sophomore through senior year. Each year, two more teachers will join the pathway; at full capacity, there will be six SJP teachers. Some Paly teachers have already expressed interest in joining the pathway after witnessing the enthusiasm of Angell and Bloom. Sophomores Dorian Johnson, Nadia Leinhos, Layla Solatan, and Tiaira Witherspoon give a presentation on Iranian History to their class. The pathway allows the teachers more freedom to teach concepts in ways that fit the needs and interests of their students. For instance, instead of teaching U.S. Government first semester like all other sophomore history teachers, Bloom’s class took Contemporary World History in the fall. At its core, the SJP highlights a unique element of trust. Students who have chosen the pathway commit to three years with the same teachers and classmates without really knowing what they were getting into. As it is a new option this year, current students could not ask upperclassmen about the pathway experience; instead, they put their trust in Angell and Bloom. Additionally, students who opted into the pathway tend to enjoy the alternative approach to learning and also value the act of giving back to the community through the service that they are required to do while in the pathway. To connect academia to the broader world, the SJP exposes students to a range of social justice issues during their sophomore year. During their junior year, Bloom and Angell will help students find internships with various organizations that have contacted them. Students will select an organization that addresses the issue that most compels them and will spend 10 hours per semester working there. Ideally, the internship will allow students to witness the work of people who seek to combat social injustice on a daily basis such as lawyers and human right advocates. “Students won’t only be able to learn about [the] issue of their interest but more importantly, they’re going to be able to see how people get it done — watching what other people are doing, having a network, how they go about their day to day business of helping, and remedying those injustices that they see,” Angell says. Once senior year arrives, the SJP will culminate in a year-long Capstone Project, where students choose an area of social justice in which to invest their time and energy. The project is meant to help students put together all of the information they have learned throughout their time in the pathway by conducting a graduate school-style research project in their area of interest. The parallels between the English and history curriculum further the SJP goal of finding purpose in serving the community. 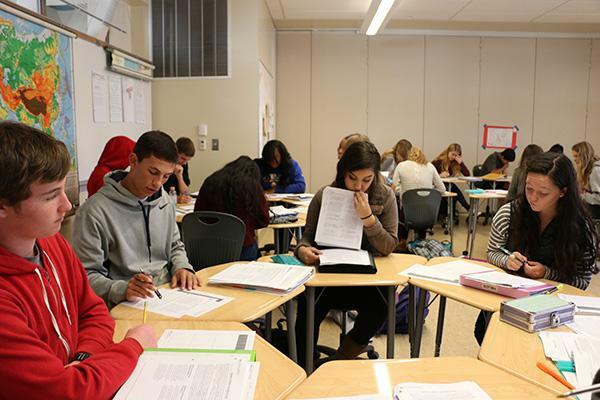 The collaboration between Bloom and Angell makes the teachers’ jobs easier and enhances the students’ learning; the natural connections drawn between novels in English and lessons in history provide a nearly seamless transition between the classes. For instance, while studying Chilean history in Bloom’s class, students in Angell’s class read “The House of Spirits,” a novel tracing historical events similar to those of the Chilean coup. Angell can focus on the literary aspects of the book because she knows Bloom will explain the novel’s historical setting in his class. To compare the student experience inside and outside the pathway, the SJP teachers sent SJP sophomore Jordan Schilling to standard sophomore English and U.S. government classes for two block periods. Afterwards, Schilling wrote a reflection of his observations and described his SJP learning as more gratifying. Within their respective classes, Bloom and Angell have implemented an alternative grading system which assesses assignments using the words emerging, competent, proficient or mastery. For shorter, lesser valued assignments such as homework or reflection pieces, students earn full credit for completion. However, the adjective attributed to the quality of work identifies which skills students should improve upon. Many students find that this creates a less competitive environment and a place where students feel more comfortable to fail and learn from their mistakes. Sophomores Jack Fitton, Jordan Schilling, Ayah Chakamkchi and Quinn Knoblock prepare for a presentation in their Social Justice Pathway history class. In an attempt to create a more collaborative environment, the SJP includes a significant amount of group work. SJP sophomore Nicole Li recalls a recent time when students worked together on their English essays. Unlike in Li’s freshman English class, Angell asks students to share their essays with each other, so they can build off of each others’ ideas. Li feels that receiving feedback from her classmates enhances her writing process. Students in the pathway feel that the collaboration leads to closer interactions between students. The classroom environment of the pathway also incorporates different teaching and learning methods. 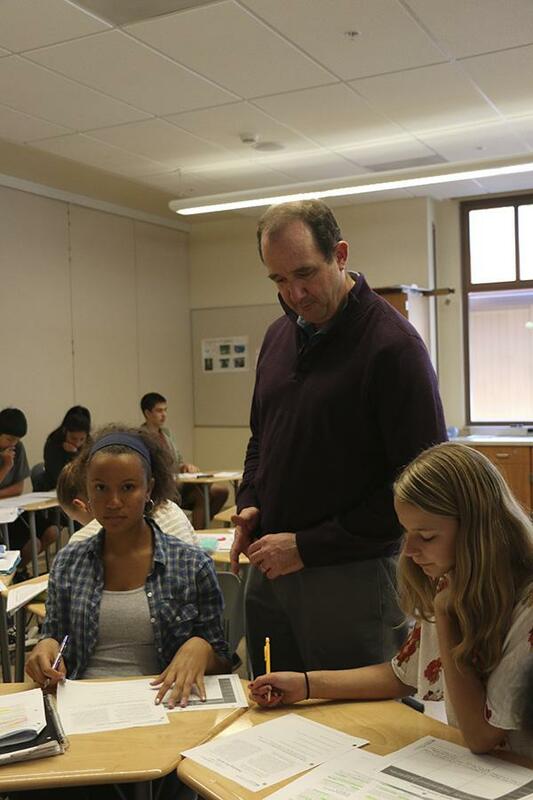 Unlike other English classes at Paly, students are given the chance to direct the class by planning and teaching a lesson. 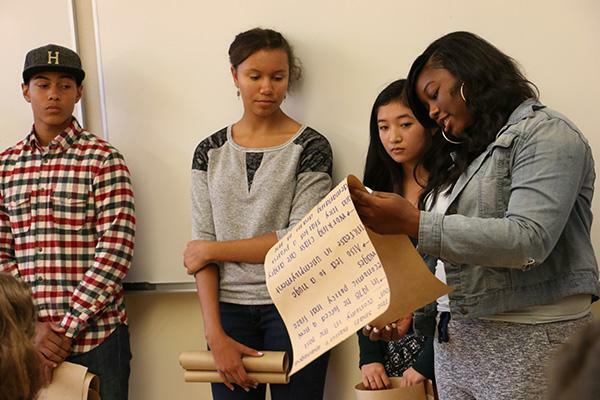 During these “SJ takeovers,” four students use a 90-minute block period to educate their class on a specific social justice issue from the English novel. “The focus is teaching things like literary devices but teaching them through the lens of social justice,” Angell says. Students generally enjoy teaching and learning from their peers. In fact, through the sophomore curriculum, students have already begun exploring social justice issues such as food justice or socioeconomic class discrimination. With social justice implemented in the curriculum, students gain a better overall understanding of what it means to participate in a community, whether it be in the classroom or on a local or global scale.